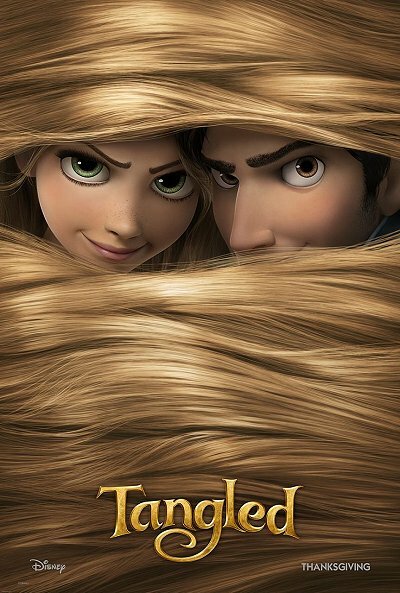 Go See Rapunzel…I Mean Tangled!! I hope everyone had a wonderful holiday with their families. I had a great time hanging out with my family during the 4-day weekend. We played games, went to a craft fair, watched football, ate, and went to the movies. We were going to see Harry Potter and the Deathly Hallows Part One (it would have been the 2nd time for me, my mom, and my dad, and the 5th time for my sister) but we chose to see Tangled instead. Boy am I glad that we chose Tangled!! Not that I don’t still love HP, but I don’t think I would have gone to see Tangled otherwise. Now I have seen it once and will probably go to it at least one more time in the theater. We just went to a regular old show, not a 3-D one, but I don’t think we were really missing out on anything. There were not a whole lot of really obvious 3-D things going on, so I don’t think it is necessary to see it that way. Let me just say that this is my favorite animated movie in a very long time. I will say that I loved Wall-E and Up, but they are so emotionally draining to watch that I just can’t do it on a regular basis. I could honestly watch Tangled every week for months and never get sick of it. I wish it was out on DVD so I could literally do that. Tangled is the story of Rapunzel (they didn’t call it that because they thought boys wouldn’t go see it…..stupid marketing people!) and her amazing magic hair. Mandy Moore does the voice for Rapunzel and I thought she was fabulous!!!! I know not everyone likes Mandy, but I have a soft spot in my heart for her because of Chasing Liberty. She does a great job with the character and of course, does all of her own singing. But the best parts about the movie were the other two main characters. Mother Gothel is the bad guy (voiced by Donna Murphy) and she is awesome. She really freaked me out. She’s emotionally abusive and totally manipulative and just plain perfect as the baddie. She reminded me of a combination of Maleficent from Sleeping Beauty and The White Witch from Narnia. But what I really want to talk about is Flynn Ryder!!! He was so fantastic!! The guys in Disney Princess movies usually don’t get to do a whole lot. They show up for a few minutes, sing a song and then disappear for most of the movie. Flynn gets just as much screen time as our fair Rapunzel and thank goodness he does because he is so funny!! Did I mention this movie is funny??? It is freaking hilarious! Zachary Levi is really good at doing Flynn’s voice, and dare I say it?? Flynn is actually kind of a hottie (does that make me weird???). The movie is funny and charming and warmed my little grinchy heart. The songs aren’t bad (they aren’t phenomenal, but they are kind of catchy) and thankfully everyone in the cast can actually sing. There is one scene near the end that was so beautiful it literally took my breath away. It reminded me of the ballroom scene in Beauty and the Beast when the camera pans down through the chandelier. My breath stopped short when I saw that for the first time, and it totally happened again during Tangled when they lit the lanterns. So gorgeous. Okay, now that I think about it, that might have been great to see in 3-D. So, I have rambled on longer than the movie now, so I will just say go see Tangled!!!!!! You will not be disappointed. Everyone in our theater was laughing and having a good time. Out of our group of four (one of whom is very picky about animated movies) we all adored it, so I know you will too. 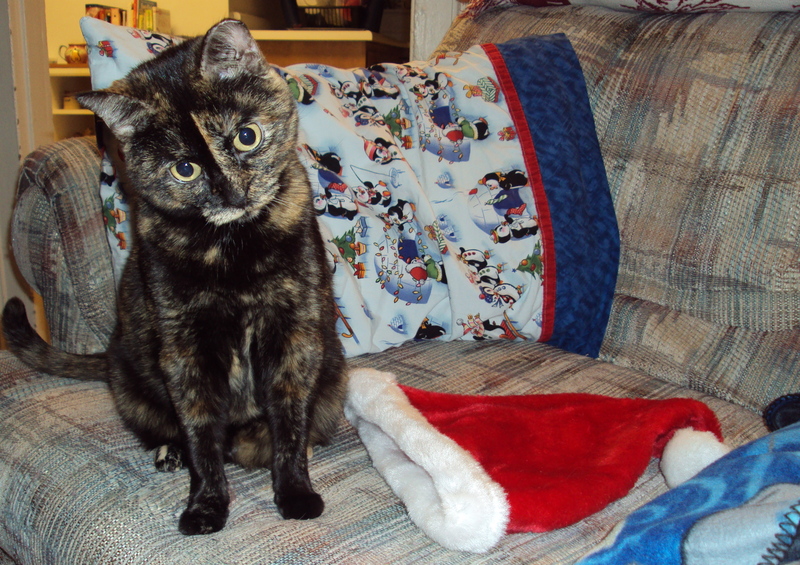 This weekend I tried to take adorable Christmas-y pictures of my cats to use for Christmas cards. This might seem shocking since I have not sent out Christmas cards in like four years. It was also a very stupid idea since apparently cats do not like to wear Santa hats (how I was unaware of this, I don’t really know). Let’s just say that the photo shoot did not go well. 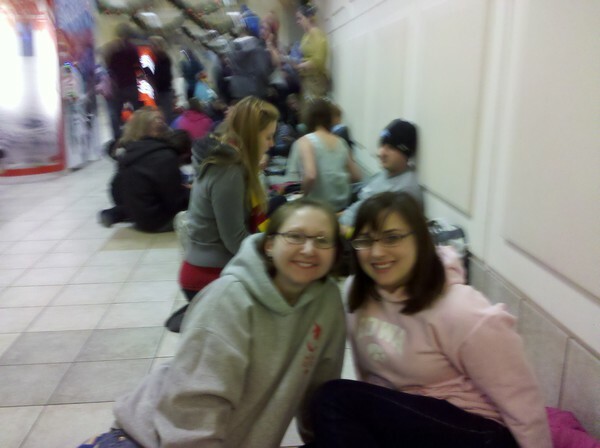 Most of the pictures are terrible, but one of them was just plain scary. I keep staring at this picture of Addie and getting freaked out because she looks possessed!!!! It kind of looks like she murdered Santa, ate him, and all that is left is his hat. Just thought I would share this with you in case she claws my eyes out in my sleep. Guys I have a problem. A couple of days ago I checked out a book – I Am Number Four by Pittacus Lore. The day after I checked it out I found out that the book was written by some poor guy who was a part of James Frey’s “YA Fiction Factory” or whatever everyone is calling it now. I found out on Twitter but didn’t really understand what was going on at first. I knew the name James Frey because I remember Oprah yelled at him a few years ago about the fact that he lied in one of his books, A Million Little Pieces. I never really paid attention to what was going on back then so I got curious and started to look some things up for myself. At first, I didn’t really understand what the big deal was. So what? The man changed pieces of his life story for a book. Big deal. But then I found out that it was supposed to be this hugely inspirational autobiography and people felt like it had changed their lives, yada yada yada. Okay then. So now I understand why people might feel pretty betrayed by his lies. Next I read several articles about his fiction factory. And I will tell you, I am pretty disgusted. Maureen Johnson explains it all incredibly well right here. I encourage you to go read what she has to say. What it all really boils down to is that James Frey is screwing over a lot of writers. On one hand, I feel like these writers who signed that contract deserve whatever they get. But on the other hand…. James Frey is just SUCH a villain! And I think he enjoys being perceived that way. In everything I’ve ever read about him interview-wise, he just comes off as this smarmy, horrible, egotistical man who thinks he’s better than everyone else. And just thinking about reading anything he’s written makes me feel icky. Which brings me to my dilemma. I really wanted to read I Am Number Four. I really wanted to see the movie too. But now, knowing what I know… I don’t think I can do either and still feel good about myself. I’ll know who was behind the story. James Frey. And I really don’t want any of my money to support him. But then I start thinking that it’s not actually Frey who wrote the book, but Jobie Hughes. So I SHOULD read it because I’d be supporting the poor soul who got screwed over. And there’s the undeniable fact that I WANT to read the book. So I bring the question to you all. What would you do? Would you say a story is a story and read it anyways? Or would you say, screw James Frey and his evilness? I can’t see a winning side to this argument. I lose either way. I probably will end up not reading the book because of how I said I’d feel dirty. But maybe some of your comments will change my mind. So what do you all think of this whole mess? I am currently on an adult nonfiction kick, since it has been forever since we’ve had new kids books at the library (hmmmm, I wonder whose fault that is???). 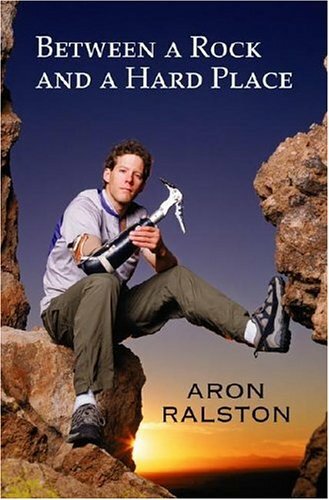 I just finished reading Between a Rock and a Hard Place by Aron Ralston, and wow…what a book! For those of you who have never heard of Aron, he is a hiker/biker/skier/mountain climber/adrenaline junky/adventurer who fell into a desert crevice and got his hand caught between a boulder and a rock wall and was forced to amputate his own hand to survive. (I don’t think this is a spoiler because he is shown on the cover of the book with his artificial hand.) Knowing all of this before starting the book, I wondered how it would hold my attention for over 300 pages. Would the first 280 pages be worth it knowing what is coming at the end? Well, I will say that it is definitely worth your time to pick up this book if you get the chance. The book goes back and forth between describing Aron’s predicament in great detail and sequences that describe his earlier adventures with avalanches, bears, and mountain climbing. There is also a part near the end that tells about how his family and friends tried to locate him during the many days that he was missing (one of the HUGE problems with his situation is that he never told anyone where he was going). The parts that describe his earlier adventures are all pretty interesting. After reading about what a 27 year-old was able to accomplish in such a short period of time, I felt like a lazy lump of a person. This guy has done so many wild and crazy things and almost died on several different occasions. I found him to be kind of a cocky guy who bordered on being an a-hole in these flashbacks. This actually made the sections about being trapped in the crevice very interesting because he kind of comes to terms with his arrogance during the ordeal. His descriptions of being trapped are very detailed and very graphic. Sometimes I was like, “Ewwwww, overshare!” but I guess that is probably why most people read the book. Even though you know exactly what’s coming, the book does build up suspense near the end. He gets trapped on a Saturday afternoon and decides it would be a miracle for him to make it to Monday. Well, it is many days AFTER Monday that he finally makes his escape. As the book got closer and closer to the end, I kept asking myself, “How is he going to do it??? ?” He knew amputation was an option, but he didn’t have a tool sharp enough to do it. The actual solution is so brilliant and brutal and really awful to read about. But by the end of the book, you totally feel like you are trapped right there with him. So, if you are into survival stories, or adventure, or thinking about going on a dangerous expedition on your own, I would recommend this book. But be warned….it is not for the faint of heart. I was flipping through the book and came to a section with photos. I was like, “Cool! Pictures!” Well, then I flipped to the next page and there was a picture of his severed hand still stuck to the wall!!!!!! AAAAAACCCCCKKKK!!!! I was not prepared for that. The reason I read this book is because it is all over the media now because of the new Danny Boyle movie 127 Hours. I don’t think I could watch the movie because it will be too intense for me, but I have heard that it is remarkable. James Franco usually rubs me the wrong way, but there is something about the way he says the second “oops” in this commercial that makes me think he can pull this off in a great way. So, are any of you brave enough to see the movie? And if you do, will you read the book first? My sister posted this on her Facebook page and it is so adorable!! 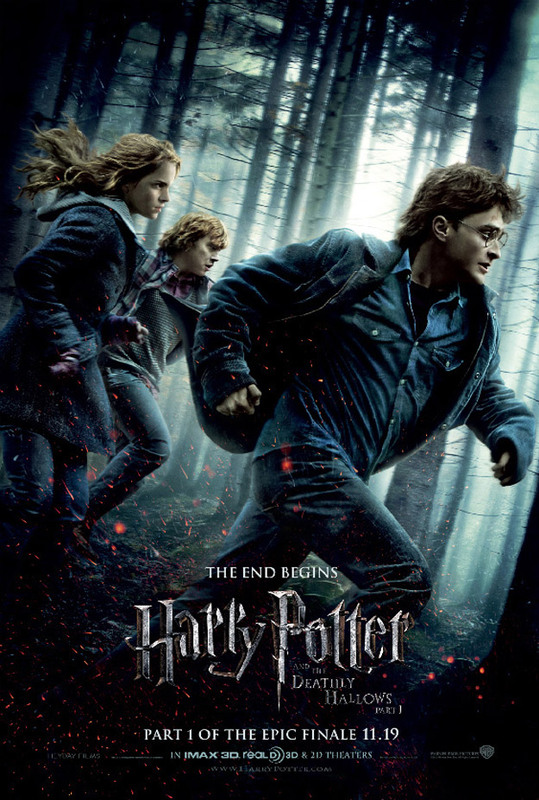 If you are even a vague fan of the Harry Potter movies, you must watch this video. How cute were they??? I love how Dan is so amused by the whole thing and Emma is adorable trying to be an American (she should be the best at it since she goes to school here now). But the MVP of this video is definitely Tom Felton….way to go taking a tiny amount of screen time and showing a killer personality! P.S. I apologize to anyone who is not a Potter fan, but I have a feeling I will be doing many, many HP related posts in the next few days. Uh-Oh…There’s a New Jane Eyre! In the past year, I have become a huge fan of everything Jane Eyre…some might even call it an obsession. I have watched at least three different versions of it (the newest BBC one at least a dozen times) and read the book. I also just recently read Jane by April Lindner, which is a modern day version of the story (great book by the way…the part of Mr. Rochester is played by a washed up rock star…loved it!). So, hearing that there is a new theatrical version coming out makes me very excited. Most people will probably roll their eyes and grumble something like, “does there really need to be a 57th version of that story? ?” To those people I say, “YESSSS!” I feel that each new adaptation adds something different to the story and gives me a new way to enjoy it. I think that there could never be too many versions of Jane Eyre (just like there can never be too many adaptations of Jane Austen novels). Doesn’t it look awesome!!! I am super excited to see Dame Judi Dench as Mrs. Fairfax and Jamie Bell as St. John. And whoever that is playing Mr. Rochester….wow…he sure knows how to smolder! I know that I will be marking my calendar to make sure to catch this in theaters….who’s with me?